Born in Philadelphia, Ben Wilson was a New York abstract expressionist painter. His work was exhibited frequently from the mid-thirties through sixties, and less frequently but consistently through the rest of the century. Decade by decade beginning in the 1930’s his painting comprises a micro history of the period’s art, while depicting what was foremost in the American consciousness of the time. Wilson’s earliest work shows an intense awareness of social and economic turmoil of the 1930’s. Dominating the content was the flow of world events beginning with the Spanish Civil War and followed by the rise of fascism, the Second World War and the plight of the persecuted, displaced and slaughtered minorities. Wilson was concerned with representing humanity and suffering in a changed world. 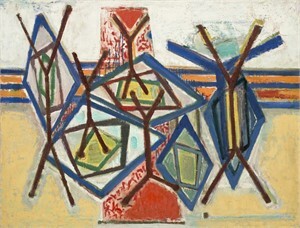 By the late 1950’s Wilson began using abstraction in his paintings, merging himself with the “New York School” of art. He shared many of the values of Abstract Expressionists like Mark Rothko, Robert Rauschenberg, and Jasper Johns. 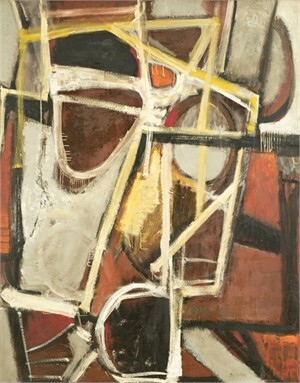 Through the sixties, Wilson completed his transition to abstraction, exhibited in New York and Paris and received a Ford Foundation artist-in residence grant. As the decade progressed he became increasingly experimental with his mediums, using house paint, sand and other unorthodox materials. Ever one to pursue a personal aesthetic path regardless of popular movements and critical reactions, Wilson increasingly withdrew from the New York art scene from the seventies on. Throughout his life Ben Wilson painted and drew every day. He left behind a large body of work and an extensive archive including exhibition catalogues, reviews, and correspondence that are now part of the permanent collection of the George Segal Gallery at Montclair State University. A portion of his archives is in the Smithsonian Archives of American Art. Wilson is listed in Who’s Who in Art; Who’s Who in the East; Dictionary of International Biography; American Artists of Renown and International Encyclopedia of Artists. His work is in numerous public collections, including Hebrew Union College-Jewish Institute of Religion Museum, New York, NY; Jane Voorhees Zimmerli Museum, New Brunswick, NJ; Rutgers University Art Library and Classics Department, New Brunswick, NJ; Bryn Mawr College, Bryn Mawr, PA; Norfolk Museum, Norfolk, VA; and Fairleigh Dickinson University Collection of Self-Portraits, NJ. Born in Philadelphia, Ben Wilson was a New York abstract expressionist painter. His work was exhibited frequently from the mid-thirties through sixties, and less frequently but consistently through the rest of the century. Decade by decade beginning in the 1930’s his painting comprises a micro history of the period’s art, while depicting what was foremost in the American consciousness of the time. Wilson’s earliest work shows an intense awareness of social and economic turmoil of the 1930’s. Dominating the content was the flow of world events beginning with the Spanish Civil War and followed by the rise of fascism, the Second World War and the plight of the persecuted, displaced and slaughtered minorities. Wilson was concerned with representing humanity and suffering in a changed world. 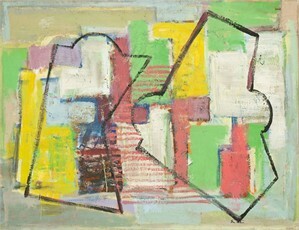 By the late 1950’s Wilson began using abstraction in his paintings, merging himself with the “New York School” of art. 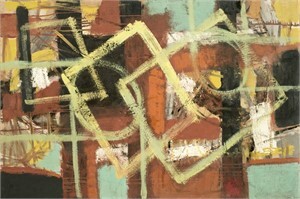 He shared many of the values of Abstract Expressionists like Mark Rothko, Robert Rauschenberg, and Jasper Johns. 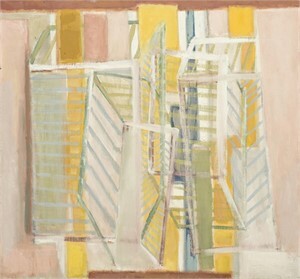 Through the sixties, Wilson completed his transition to abstraction, exhibited in New York and Paris and received a Ford Foundation artist-in residence grant. As the decade progressed he became increasingly experimental with his mediums, using house paint, sand and other unorthodox materials. Ever one to pursue a personal aesthetic path regardless of popular movements and critical reactions, Wilson increasingly withdrew from the New York art scene from the seventies on. Throughout his life Ben Wilson painted and drew every day. He left behind a large body of work and an extensive archive including exhibition catalogues, reviews, and correspondence that are now part of the permanent collection of the George Segal Gallery at Montclair State University. A portion of his archives is in the Smithsonian Archives of American Art. Wilson is listed in Who’s Who in Art; Who’s Who in the East; Dictionary of International Biography; American Artists of Renown and International Encyclopedia of Artists. His work is in numerous public collections, including Hebrew Union College-Jewish Institute of Religion Museum, New York, NY; Jane Voorhees Zimmerli Museum, New Brunswick, NJ; Rutgers University Art Library and Classics Department, New Brunswick, NJ; Bryn Mawr College, Bryn Mawr, PA; Norfolk Museum, Norfolk, VA; and Fairleigh Dickinson University Collection of Self-Portraits, NJ.